This rose certainly brighten up my morning! What a lovely 'creative' photo! Were the water droplets on the rose or were those something that you added to enhance the shot? Very, very nice and you certainly got some beautiful flowers for your birthday that made great subject matter! Linda, I had watered the bouquet earlier in the day. The water droplets were the result of giving them a drink. I thought it added beauty to the photo. 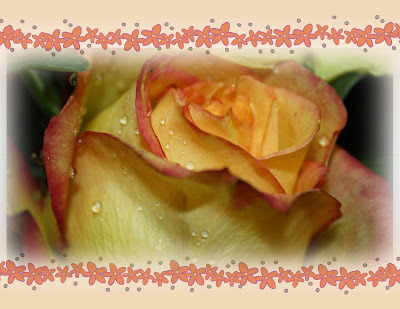 Lovely photo of the rose, and I agree with you that the water droplets add beauty to the photo. I came to say bye, bye for a while - I'm busy packing and then going to have relocation break! See you again in April!